There are artificial self-imposed targets, plans and even laws – and then there’s reality, if ‘keeping the lights on’ is a priority. Scrapping nuclear capacity implies either having something convincing to replace it with, or risking the wrath of the voters if/when things start to go wrong. The French environment minister Nicolas Hulot says the government is postponing its move to reduce the share of nuclear energy in the country’s power generation mix, reports PEI. According to Reuters, Hulot says the grid operator RTE warned it risked supply shortages after 2020 and could miss a goal to curb carbon emissions, if it went ahead with the cull of nuclear right away, reducing the share from 75 per cent to 50 per cent. “It will be difficult to maintain the target of reducing the share of nuclear to 50 percent by 2025,” Hulot told reporters following a cabinet meeting. He later said in a television interview the government would be working towards a 2030 to 2035 timeframe. The minister added that in one year the government would provide the guide on which facilities will be set for closure and when. Now I see the real reason that EDF has been pushing for ‘smart’ meters (they are opposed rather vigorously in a lot of regions) – they are in panic mode. I should have added the URL for one of the active anti ‘smart’ (linky) meter organisations. These are the people that the minister is afraid of – maybe he learned a little history about how the people dealt with those that oppress them and in my area lack of power is considered oppression. A recent study shows that Germany is polluting nearly 10 times more than France. Why would the French want to change anything at all? Sat in my petite ruine in Brittany in front of my woodburner, I’m not surprised the French gov is backtraking. I can see 15 wind turbines from the end of my bit of land. None of them were turning when I crunched across me frosty field at 8am today. Common sense has died. France’s demand is in a similar ballpark to California’s (70 vs. 55 GW). I sure wish CA has 40 GW of nuclear, instead of planning to prematurely shutter our last two reactors. I guess the new French Revolution may occur in 2025 when their grid fails and the bourgeoisie rise up again against the overlords. May be the French number crunchers can see the reality of the Ecoloon push to destroy western civilization. 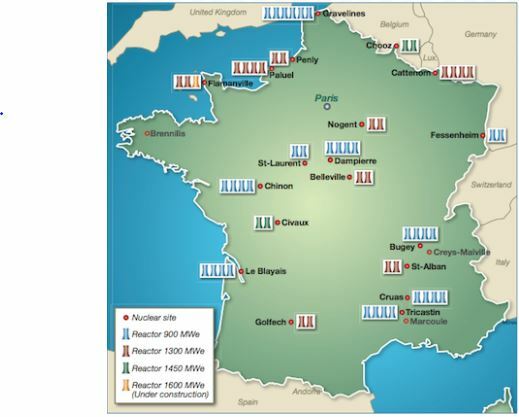 Nuclear is the future source of Industrial levels of clean energy and the French are already nearly there. Why wreck something that works to placate the “Greens” drive to pauperize and enslave the people? ‘Hulot says the grid operator RTE warned…’ – i.e. inconvenient reality rears its head. as roger knows there are hundreds of windmills along the north france littoral and they are not stopping there. Right across france, german windmill makers are trying to erect them as fast as they can. Fessenheim will close soon and several other nuclear stations are on the list. Hublot and his wife are watermelons through and through and have said they will be judged on their achievements next year. Macron is a little napoleon and nothing is going to get in his way to be president of one nation Europe and controlling all countries, their peoples and their budgets. Meanwhile back in the world of sanity, both South Africa and Argentina want secure electricity supplies, so ruinous renewable take a back seat to NUCLEAR. Rosatom, South Korea’s Kepco, France’s EDF and Areva, Toshiba-owned Westinghouse and China’s CGN are competing for South Africa’s project, which could be worth tens of billions of dollars to develop up to 9,600 MW, should it get the green light. A new Candu reactor with capacity of 720 MW will be built by Canadian company SNC-Lavalin’s Candu Energy unit and Argentina state nuclear company NASA. A second project is for a 1,150 MW Hualong One reactor to be built by China National Nuclear Corp (CNNC). “We are finishing negotiation of the commercial and financial contracts to build two new power plants. We will begin to construct these plants in the second half of 2018,” Gadano told Reuters on the sidelines of a nuclear power conference in Abu Dhabi. In the real world reliability of supply matters. Only in the unreal world of Green politics would anyone consider using unreliable sources of electricity as a viable way to power a country. It seems the only reason for closing down nuclear sites is the problem of storing the nuclear waste. Yet it has been shown that the liquid thorium process produces no waste and can use up existing stored waste. Liquid thorium leaves 5% waste. Even when burning old fuel. A cloud of radioactive pollution over Europe in recent weeks indicates that an accident has happened in a nuclear facility in Russia or Kazakhstan in the last week of September, French nuclear safety institute IRSN said on Thursday. The IRSN ruled out an accident in a nuclear reactor, saying it was likely to be in a nuclear fuel treatment site or centre for radioactive medicine. There has been no impact on human health or the environment in Europe, the IRSN said. On South African nuclear – apparently our highly un-esteemed President Zuma has made some sort of secret deal with Russia to build a fleet of nuclear plants. And our brand-new Finance Minister (the FIFTH in 3 years) has said that SA is broke and cannot afford them. But what the Big Man says usually goes! Meanwhile, our central electricity company Eskom has reported that buying renewable power costs more than twice the most expensive coal-fired power, because of the work that has to be done to the grid to accept it. However,. our ignorant politicians are pushing for more renewables, because it’s the “peoples’ power”. Finnish reactors are remarkable in the extent to which they have been uprated since they were built. TVO’s Olkiluoto 1&2 started up in 1978-80 at 660 MWe net (690 MWe gross); 30 years later, they were rated at 880 MWe net each (one-third more) and their lifetime had been extended to 60 years, subject to safety evaluation every decade. TVO now proposes progressively to uprate them further to 1000 MWe each. A 25 MWe uprate of Olkiluoto 1 over May-June 2010 was part of this, and involved replacement of low-pressure turbines. A similar uprate of unit 2 to almost 910 MWe gross was undertaken over May-June 2011. With uprates, TVO aims “always to have 40 years of remaining technical lifetime”. In January 2017 TVO applied for 20-year licence renewal for both units, and has submitted an extensive periodic safety review to STUK to support this.